The post-hurricane recovery processes of two universities are presented in this chapter, with an emphasis on the experiences specific to their library facilities and holdings. Interviews were conducted with library staff and campus leaders at both institutions. Case studies are constructed of the experiences of these libraries with Hurricanes Katrina and Rita in the Fall 2005 Semester. One library experienced major destructive damage and the other suffered minor damages to the collection. The tales of recovery presented lead to implications for disaster management within academic libraries. Recommendations are offered for each stage in the crisis management process: planning, prevention, response, recovery, and learning. 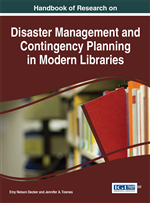 These recommendations provide guidance on disaster mitigation and contingency planning for librarians, library staff, archivists, curators, and university administrators. Crisis management is the process of planning for, organizing and implementing a response to an emergency situation. The crisis management process is often described as occurring in separate stages, and multiple conceptualizations of these stages have been offered by different researchers. The resultant crisis management models have ranged from three to five stages. Five stage models have been offered by Pauchant and Mitroff (1992), Zdziarski (2006), and Zdziarski, Rollo, and Dunkel (2007); these models each add a learning phase to the end of the crisis management cycle. Thus, crisis management, as described in the literature, is a cyclical process with the following stages: planning and mitigation, preparation and prevention, response and business continuity, recovery, and learning (see Figure 1). This chapter will touch on all phases of the crisis management cycle, placing emphasis on the lessons that can be learned from other institutions of higher education, and specifically their libraries. Crisis Recovery: The actions taken in the long-term aftermath of a crisis to return organizational operations to their previous state and to mitigate the potential effects of future crises. Academic Library: A library that is part of an institution of higher education. Campus Crisis: An emergency situation that impacts an institution of higher education. Generally defined as “an event, often sudden or unexpected, that disrupts the normal operations of the institution or its educational mission and threatens the well-being of personnel, property, financial resources, and/or reputation of the institution” ( Zdziarski, 2006 , p. 5). Crisis Management: The actions taken by an organization to prepare for, mitigate, respond to, and learn from the impact of a crisis. Disaster Management: The application of the crisis response processes and recovery to a disaster. First Responders: The first people within the organization to respond to a crisis event. Crisis Response: The actions taken in the immediate aftermath of a crisis event to contain the situation, limit the damage to organizational structures, communicate with important audiences, and avoid disruption to organizational activities and functions. Disaster: A large-scale crisis that affects the operations and resources of both the organization and the community that physically surrounds the organization.